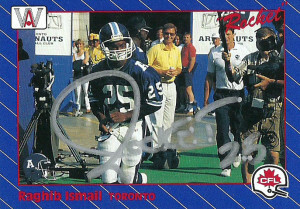 Shortly after attending one of the Dallas Cowboys Rally Days where I met Rocket and got his autograph on a handful of cards, he started signing TTM again. 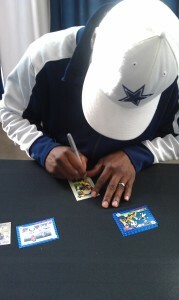 I thought initially, “Oh well,” but knew I needed to double back to him to get a few more cards signed. So rolling over to 2018, what better way to kick it off by getting Rocket again as my first autograph of the year? 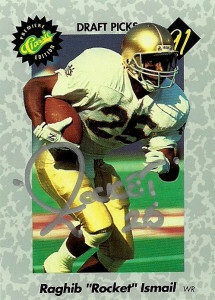 These cards really offer a cross section of his career starting at Notre Dame on this Classic 1991 promo card. Hand it to Classic trying to be edgy out of the gate, but the name line feels right aligned because the weight is tied to WR. I also wasn’t too big a fan of the brushed granite look, but it beats the cheetah pattern they later used. Overall, it’s a great photo of Rocket and there were quite a few of them to choose from. From there we move on to the terrible All World CFL series, which tries to emulate the ProSet 1989 design by just angling the lines. There’s also the terrible color choices as the red and blue just feel like they clash a bit too much. It does not help that the Argonaut helmet just sort of -sits there arbitrarily on the canvas. As a promo however it sells what it is: The first set to have Ismail in his professional debut threads. 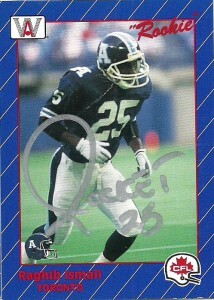 After his time in the CFL, Rocket jumped back to the NFL courtesy of the Los Angeles Raiders. It seemed to make sense. I mean the only other place with as bright stars and marketing would be Dallas, right? I liked this card. Fleer 1995 was all.. over.. the.. place.. design wise from team to team. It embodied everything I liked and hated in the 1990s sets as the companies started really embracing Photoshop. This one for example has a very unnecessary grain. I like the fearlessness of the design on the front, but it is a bit too much. After his time with the Raiders, a stop in Dallas was next. It took me a while to come around to the sets of the early 2000s as I didn’t collect any while I was on my football hiatus. Among them I liked the die cut Atomic. I have a soft spot for gimmicky cards, and these certainly look better once you see one. Rocket was one of the original players that I wanted when I first returned to the TTM hobby back in 2010. He had made such a memorable impression on me when I was younger that I put him near the top of my list to find when I returned. I even went so far as gathering the cards, writing his address, and putting a stamp on an envelope. 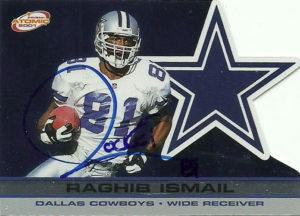 It was then I found out that Ismail does not sign through the mail. Time passed and I put everything aside with my move back to Austin. 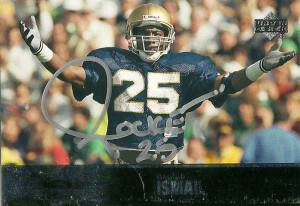 Over the past few years I’ve done a decent amount of TTM, but the speedy Ismail kept eluding me. It was then that Dallas started offering “Rally Days” (a fan-centric event at the Cowboys stadium where they give tours of the stadium and ex players sign autographs.) From what I understand the Cowboys organization has been up to this for a while now, and after recent events had featured Rocket signing, I had begun to be whipped up into a fever. Now, Ismail 99% of the time only signs “Rocket” at the free events. It is only at the paid signings he usually gives out his whole signature; However, under rare circumstances he will sign it for the first person or two in line at a free event. I could care less, as I would be pretty happy either way. In the end I did get the ‘shorthand signature’ but he did sign everything I brought. After driving to Dallas and waiting for well over an hour, I got up to the front. It had been an excess of Rocket’s time signing, and at these events, the next guy just replaces the one sitting at the table. 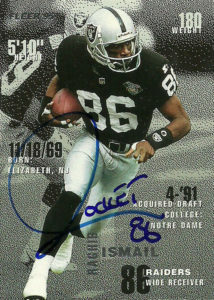 Ismail is very, very good to fans in person. He spends a few minutes with each one of them, looks them in the eye, shakes their hands, talks to each one, signs a few things, and takes a photo or two. This is great, if you are at the front of the line. It’s not so great if you’re number 62 in line. Very easily, Rocket probably would’ve been able to go through the line 2 or 3 times if he had been ‘handled’ a bit more, but as fans began to clamor and shout, “Hurry up!”, I coldly calculated that I ran a very strong chance of being the last person who would be able to get Rocket that day- and that is exactly what happened. As a drew a sigh of relief and approached the table, Rocket shook my hand, I told him that I had driven from Austin and had gotten lost getting here. He was surprised I came from so far away, and then asked me how I got lost, to which I said, “Let’s not talk about it.” Rocket got super excited when he found out that I owned a pair of his Reebok Paydirt hi top Pumps back in the early 1990’s and just as excited when he realized I was a ‘card guy’. Rocket then signed everything I had on me as Mel Renfro emerged from the curtain behind him. I began to feel badly when I realized I was the last person who was going to get his autograph that day, but he insisted on signing every one of them, despite my protests. Still all in all Rocket was the prize I had been after all along. 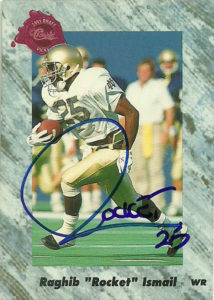 Card companies set up shop like crazy during the early 1990’s but there was no feeding frenzy like that surrounding trying to capitalize off of Raghib “Rocket” Ismail. 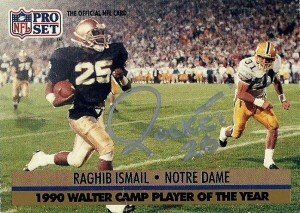 There was quite a buzz surrounding Rocket when he came out of Notre Dame and every card company wanted to say they had Ismail’s rookie card, because he was the next sure thing to drive sales. In the end, Rocket threw everybody- including the NFL -for a loop. Bruce McNall was a wheeling and dealing regular Donald Trump of Canada, and he had decided that it was time to buy into gridiron football. Unable to secure an NFL franchise, McNall set his sights on the next best thing at the time: the CFL. Grabbing business partners Wayne Gretzky and actor John Candy, they bought a controlling stake in the Toronto Argonauts. After making waves with the purchase, McNall brazenly fired the first shot at the NFL, signing Rocket to an insane $18 million dollar contract. Rocket was to be the new face of the Argonauts, McNall’s media empire (which included All World Sports Cards), and the CFL. 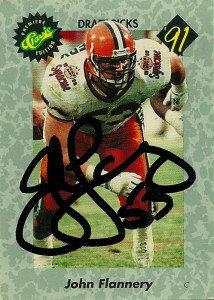 All World hastily put together a 1991 CFL football card set 120 or so strong. Fully trying to capitalize off of the Ismail frenzy, AW produced 10 different cards covering Ismail in the set. The first year in the CFL, Rocket certainly had NFL executives worried about the Canadian invasion. He lived up to all the hype and excitement that scouts had predicted. With rumored sub 4.2 speed, Ismael could play not only receiver, but also returned kicks, punts and provide mismatches in the slot as a runningback. 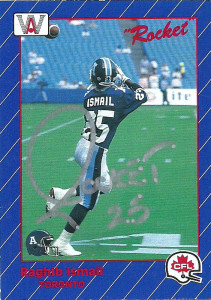 Ismail caught 64 passes for 1300 yards and 9 touchdowns his rookie season. He also ran for 271 yards and 3 TDs. Rocket averaged 25.4 yards on 31 kick returns and returned 48 punts for 602 yards including a 73 yard touchdown. 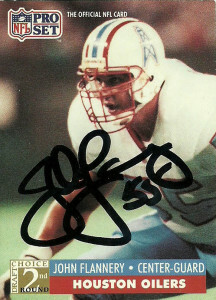 Finishing second in RotY voting, he was named to the CFL All-Star team for his efforts in 1991, culminating in winning the Grey Cup and being named MVP after the season. 1992 was a frustrating season for Raghib as the team slumped to a 6-12 record. His numbers were down offensively, while his special teams statistics ticked up only marginally. With a financial noose tightening around the organization, Rocket came to an agreement to leave the team- and the league, after the 1992 season. 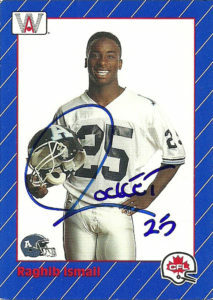 Rocket arrived in the NFL as a member of the then Los Angeles Raiders in 1993. The Raiders shrewdly used a 4th round pick in the 1991 draft on Rocket. The legendary Al Davis, unable to resist the lure of Ismail’s speed gambled and came up spades. After particularly ornery contract negotiations, Rocket finally came to terms with the Raiders. Never fully living up to the billing and the completeness at which he dominated the CFL in 1991, Rocket spent three years in LA/ Oakland. Starting only 16 games, he had 1357 yards and 9 touchdowns on 88 receptions, and a 21.5 yard average on 104 kick returns. The Raiders, traded Rocket in 1996 to the Carolina Panthers for a 5th round pick. 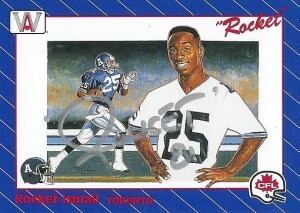 While the team excelled that year, Rocket only averaged a paltry 16.5 yards per game and failed to score a touchdown. He’d begin to see more playing time in 1997, culminating in a fine 1998 campaign that’d result in his first 1,000 yard season receiving as quarterback Steve Beuerlein‘s favorite target. The Cowboys poached Rocket off of the Panthers roster. It was ironic considering that Dallas had engineered a trade in the days coming up to the 1991 NFL draft that would have allowed them to take him with the #1 pick, if he hadn’t signed with the CFL. Now here he was joining the team in 1999. It was a vastly different time. Aged were the days of the Super Bowl Cowboys. Chan Gailey was head coach, and Irvin, Smith, and Aikman were getting on in years. Aikman began to complain openly of the staleness that Gailey’s offense ran with. To make matters worse, Irvin would be critically injured in a matchup against the Eagles. Insert Rocket here as the hero of the hour. Ismael stepped in and did his best, catching the winning TD in OT over the hated Redskins in the first game of the season. He’d post his best season as a pro with 1097 yards receiving. After a disappointing 2000 campaign, Rocket played one final season in 2001, for the Cowboys before retiring. Rocket has been pretty busy since retirement. Living in the Dallas area, he’s been making the rounds on the Rally Day circuit. He’s been a celebrity TV personality on a few shows, appeared as a commentator on the 4 letter network, and was a coach in the Slamball leagues. Considered one of College’s greatest players, it is surprising that Rocket has not been inducted into the College Football Hall of Fame. He lost the 1990 Heisman Trophy race to quarterback Ty Detmer, but as a consolation did land the Walter Camp Award. He is also considered one of Notre Dame’s finest athletes ever to don a golden dome. Rocket’s career stat line for the Irish is: 1,565 yards receiving, 1,015 yards rushing, 1,271 yards on kick returns, and 336 yards on punt returns, to go along with 15 touchdowns. Cards: ProSet 1991, Score Supplemental 1991, Upper Deck 1992, Star Pics 1991, Classic 1991. 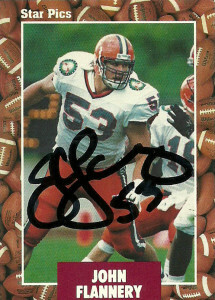 John Flannery was a multifaceted offensive lineman for the Syracuse Orangemen during the late 1980s. He played guard his rookie season and then shifted quickly towards center by his senior year, cementing his legacy as the college’s best snapper since Doug Marrone. The Syracuse offensive line was considered the best in the nation, and Flannery was considered the best of the bunch, helping the school challenge for the national title in 1987. At 6’4″, 304, John had the tools to excel at the next level, and an eye popping combine that helped cement his draft status running a 4.98 40. A decorated lineman, he received All-American honors in both 1990 and 1991 and was co-captain of the team, finishing as a semi-finalist for the Lombardi and Outland Trophies for the nation’s best lineman. As an added bonus he could play on special teams as a long snapper. 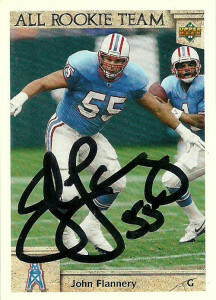 A solid prospect coming out of college, Flannery parlayed an excellent Senior Bowl game into becoming a second round choice of the Houston Oilers in 1991. Later in the 3rd round, Houston selected Kevin Donnalley as well. This draft actually proved to be a fairly solid one for the Oilers, with Darryll Lewis, Steve Jackson, Marcus Robertson, Gary Brown, Shawn Jefferson, Gary Wellman, and Mike Dumas– all seeing significant playing time and decent careers in the league. The Oilers were very deep on the line, but with the declining health of Dean Steinkuhler and Mike Munchak, there was always room for depth, so both Flannery and Donnalley made the team as well. Flannery drew the unenviable opening day task and trial by fire of blocking Los Angeles Raiders’ defensive end Howie Long. John in the end performed well limiting him to only 2 tackles, while opening up running lanes for both Allen Pinkett and Gary Brown. 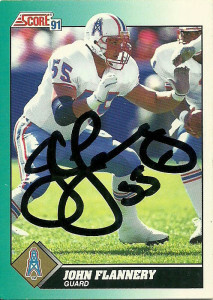 He started 8 games for the team that year, as Bruce Matthews moved to center to cover for Doug Dawson. For his efforts, Flannery earned All-Rookie team honors that season. A knee injury sidelined Flannery for the entire 1993 season, but he came back and started the entire 1994 campaign for the team, replacing retired Mike Munchak. As the salary cap ratcheted up on the Oilers in 1995, the team cut many players in order to stay afloat. In order to keep Bruce Matthews in the mix, John and his 900k salary was cut. Flannery signed with the Green Bay Packers, over the Jaguars, where he was expected to start at left guard- but a failed physical due to his knee injury, sent him packing back to Houston for more rehab and another medical opinion. Given a clean bill of health, John signed as an UFA with the Dallas Cowboys in 1996. The team decided to roll with Flannery at right guard, (allowing the team to shift Larry Allen from guard to tackle,) but injuries limited John to 1 game. Returning in 1997, he started 4 games for the Cowboys. 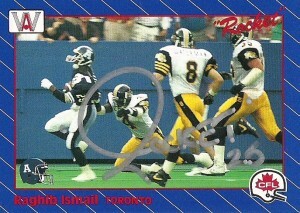 1998 saw John make one final change of scenery, as he moved to St. Louis to play center for the Rams. In that final season he’d start 15 games for the team and make his first and only reception for 2 yards. After tearing his ACL in training camp in 1999, John finally decided to hang up his cleats. He currently lives in Houston as where he works in the oil industry as an estimator. He kindly signed these cards for me care of the Syracuse alumni association. While John is not the most recognizable of names, he did have a fairly long, respectable, and battle scarred campaign in the NFL.